If you're a musical theater nerd, I don't need to tell you what an ingenious piece Jason Robert Brown's The Last Five Years is. A simple story of a relationship told from both sides, one chronologically forwards, one chronologically backwards. 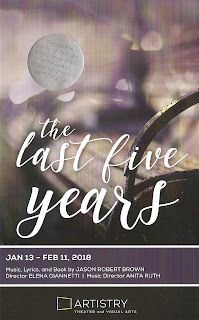 Premiering in Chicago and Off-Broadway in the early aughts, L5Y received a bit of a resurgence recently due to the recent movie adaptation; Artistry's nearly sold-out show is the fourth local production I've seen in (sorry) the last five years. And I have to say, I enjoy it a little more each time I see it. In fact I very much enjoyed this production, partly because of my familiarity with the complexities of the piece, and partly because it's really well done. The Black Box space is small enough to provide the intimacy the piece needs, with just a sparse two-person band, and a truly fantastic young cast in Aly Westberg O'Keeffe and Ryan London Levin. The run is nearly sold out, so call the box office if you want to get into this one (continuing through February 11, more info here). The beauty of the piece is in its sparseness. It doesn't fill in all the blanks, it doesn't give us all the details. 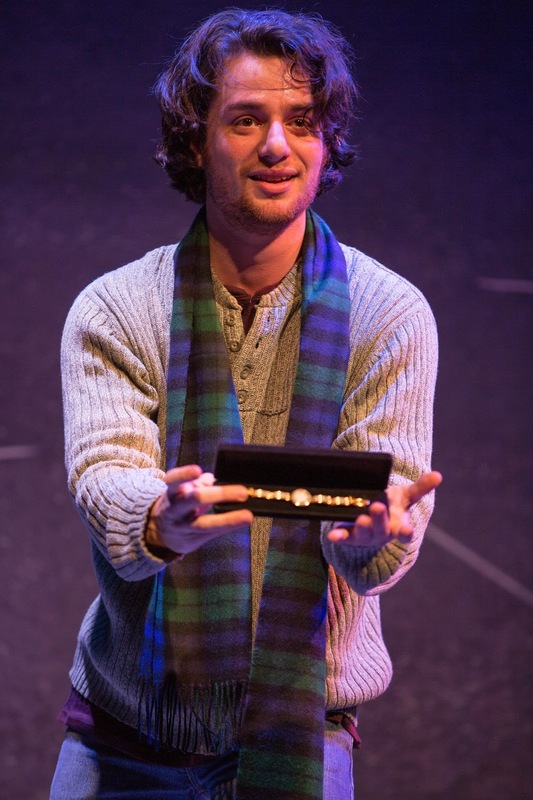 But Jason Robert Brown is so gifted in capturing the emotions of a moment in a single song, that the show is almost like a dozen little stories all woven together. You may not know everything about these characters, but you know who they are, thanks to the brilliantly written songs, and the performances in this production. This gorgeous, clever, complex score is beautifully sung by Aly and Ryan, both of whom I've been a fan of for several years. Ryan is so charming as Jamie (but even Ryan's charm cannot save Jamie from being a jerk in my eyes), full of energy, playful and passionate. Aly has a voice as clear and strong as a bell, with great control, and can convey so much emotion through her voice. The two have opposite arcs, one from naive and hopeful to mature and disappointed, and the other vice versa. Both are convincing in their journey, and their one meeting in the middle of their stories is so lovely, I wish there were more of it. The staging of the piece by director Elena Gianetti is appropriately simple, as are the set and costumes. 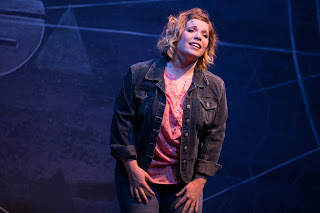 A shallow stage with a few steps and a ramp, simple costume changes as we move through time (scenic design by Benjamin Olsen, costume design by Annie Cady). Music Director Anita Ruth accompanies the cast on piano, and along with Joan Griffith on guitar/bass/mandolin is the complete band, a wise choice to keep the orchestration simple to let the beauty of the score shine through. I was introduced to the word "duologue" through Gremlin Theatre's fantastic two-hander A Steady Rain (now playing, go see it! ), and it fits this piece as well. The Last Five Years is a sung duologue, with two people telling their side of the story, through song, to the audience, rarely interacting with each other. Yet through it all you get a picture of their relationship. A beautifully flawed picture. *Plot summary borrowed from what I wrote about Minnesota Jewish Theatre Company's production a few years ago.